Bristol Old Vic today announced the full cast for its Christmas programme – a kaleidoscope of choice for whatever Christmas means to you! 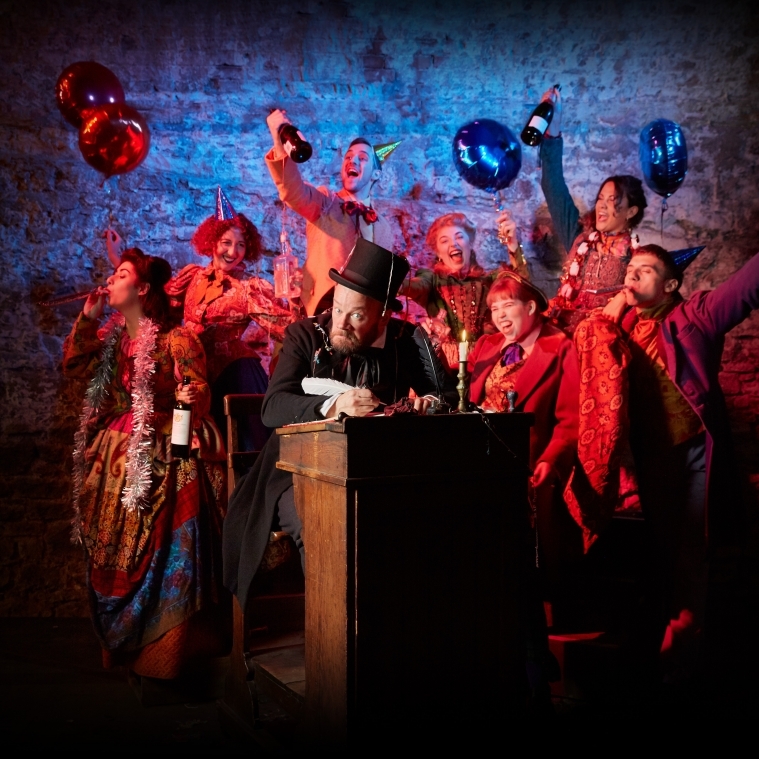 Christmas is coming to King Street as Bristol Old Vic offers a packed programme of festive treats to make the holiday season go with a bang. We’re delighted to announce that Bristol favourite Felix Hayes returns to Bristol Old Vic to play the most iconic of all Christmas characters – Scrooge – in a new adaptation of Dickens’ classic tale A Christmas Carol, from Tom Morris (Swallows & Amazons), and directed by Lee Lyford (The Snow Queen). Felix returns to Bristol Old Vic after two smash-hit performances as Rochester in Jane Eyre and Dad in A Monster Calls. Both productions went on to play at venues across the UK and received rave reviews. He also joined the cast of Bristol’s mega-hit Peter Pan for its transfer to the National Theatre in Christmas 2016 and is well-known for his work at the Tobacco Factory (101 Dalmatians, The Tempest) as well as appearing nationally at theatres including the RSC and the Rose Theatre Kingston. Bristol Old Vic is also thrilled to welcome back Saikat Ahamed in the roles of Freddie and Mrs Cratchitt. Saikat was last seen at Bristol Old Vic in his unforgettable role as Tinkerbell (Peter Pan) and as Ben Gunn in the Theatre’s outdoor production Treasure Island. Saikat has toured his solo shows The Tiger and The Moustache and Strictly Balti and is now working on his new solo show, In Search of Goldoni. He will soon be appearing in the upcoming Disney live action remake of Aladdin, due for release in 2019. Neil Haigh returns to Bristol Old Vic in the ghostly role of Marley. His previous work at the theatre includes developing his own work through Bristol Ferment as well as World Cup Final 1966. Other theatre work includes The Twilight Zone (Almeida) and The Trial (Young Vic). It’s also a warm welcome back to Bristol for Bristol Old Vic Theatre School graduates and 2018 Peter O’Toole Prize winners, Beau Holland and George Readshaw. Nadia Nadarajah is welcomed to Bristol Old Vic for the first time in the role of Bob Cratchitt. Nadia is an actor who uses British Sign Language and is a passionate advocate for the full integration of BSL into performance, not just as a tool for access. Nadia’s extensive stage work most recently includes appearing at Shakespeare’s Globe Theatre as Celia (As You Like It) and Guildenstern (Hamlet). She has appeared regularly with Deafinitely Theatre company, playing roles including Female Pilot (Grounded), and Hippolyta and Titania (A Midsummer Night’s Dream). Other work includes The House of Bernarda Alba and Our Town (Royal Exchange) and Can I Start Again Please (Sue MacLaine Company). Also making her Bristol Old Vic debut is Crystal Condie as Belle. Recent stage productions include The Curious Incident of the Dog in the Night Time(National Theatre); Twelfth Night (Filter UK Tour); Larksong, Unearthed, The Gift (all New Vic Theatre) and Black Crows, Octagon (both Arcola). Spectacular live music will be composed and performed by award-winning musician Gwyneth Herbert (The Snow Queen). With one foot in the jazz world and the other somewhere in the future, she has worked in collaboration with writers, musicians, directors, clowns, pirates and young people to make a huge canon of genre-defying work. She’ll be joined on stage by musicians Christophe Le Pu and Harry Bird. Bristol Old Vic’s brand-new Weston Studio theatre launches its very first Christmas season with a story of bravery and brilliance from the award-winning theatre company Ad Infinitum. Their innovative and inspiring storytelling will support Bristol Old Vic’s long-standing promise to create great theatre for our youngest audiences. In this new space dedicated to children and the future of theatre, Chloe and the Colour Catcher heralds the start of a new commitment to awakening the imagination in all of Bristol’s children and celebrating the uniqueness in every one of us. The cast and creative team are some of the region’s most creative theatre-makers. Directed by Nir Paldi (Ad Infinitum) the cast includes puppeteer and performer Charlotte Dubery (The Borrowers – Polka Theatre), actor, musician and theatre-maker Hanora Kamen (Associate Artist with The Wardrobe Ensemble), Bristol Old Vic Theatre School graduate Peter Edwards (Pink Mist – Bristol Old Vic; Romeo and Juliet – Insane Root) and musician and composer Brian Hargreaves (Cinderella: A Fairytale –Tobacco Factory; Tiddler and Other Terrific Tales – UK Tour). Following on from last year’s pioneering sell-out baby and toddler show Ice Ice Baby, this year’s sensory show for the tiniest theatre-goers will take place in the new Coopers’ Loft; a fully-accessible, relaxed space tucked snuggly in the eaves of Bristol Old Vic. And finally, if you like your Christmas theatre with a little more spice, the irrepressible Living Spit bring their Nativity to the new Weston Studio for a late night dose of naughtiness. With the usual mix of silly songs, pitiful puppetry and more Biblical befuddlement than you can shake a figgy pudding at, Living Spit’s Nativity promises to be a cornucopia of comic Christmassy crudeness that you’ll never forget. To make your Christmas at Bristol Old Vic complete, our new 1766 Bar & Kitchen will be bedecked in decorations inspired by the Victorian splendour of A Christmas Carol. Immerse yourself in the true spirit of Christmas as the brand new food and drink venue, right in the heart of Bristol Old Vic, provides everything from a festive feast for all the family to a mini snack from the kids menu, whatever the time of day! For more information visit bristololdvic.org.uk/1766. We look forward to seeing you there! Bristol Old Vic is the longest continuously running theatre in the UK, and celebrated its 250th anniversary in 2016. Under Artistic Director Tom Morris and Chief Executive Emma Stenning, the historic playhouse aims to inspire audiences with its own original productions, both at home and on tour, whilst nurturing the next generation of artists, whether that be through their 350-strong Young Company, their many outreach and education projects or their trailblazing artist development programme, Bristol Ferment. They use their funding to support experiment and innovation, to allow access to their programme for people who would not otherwise encounter it, or be able to afford it, and to keep their extraordinary heritage alive and animated. On 24 Sep 2018, Bristol Old Vic completed its 2-year multi-million pound redevelopment project, which transformed its front of house space into a warm and welcoming public building for all of Bristol to enjoy, created a new studio theatre and opened up its unique theatrical heritage to the public for the first time.